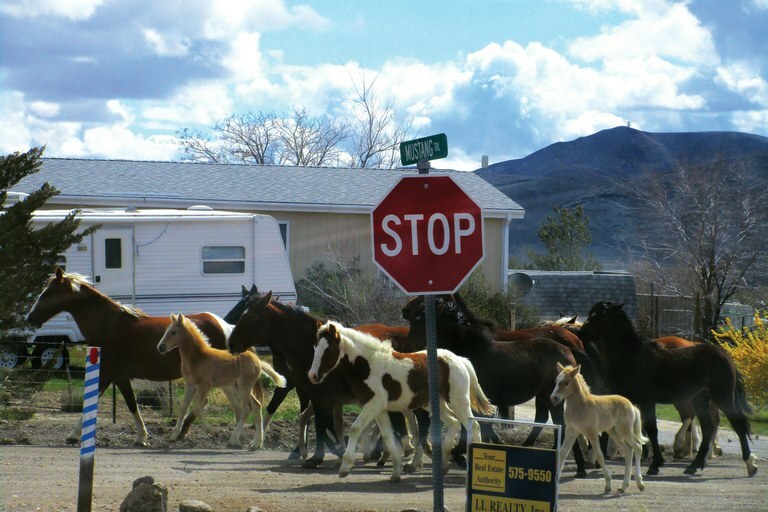 NEVADA: The intersection of mares and Mustang. Visitors to Alaska’s Katmai National Park love watching burly brown bears gorge themselves on sockeye salmon. The grizzlies that hang out at Brooks Falls are huge and wet, and every week they grow visibly bigger, some adding up to 90 pounds in a day. That’s so they can snooze without eating through five months of hibernation, during which they lose about one-third of their body weight. The annual feeding frenzy is an ideal opportunity to educate people about bears, so staffers at the park decided four years ago to host an annual “Fat Bear” contest, in which the public votes for the grizzly that appears to have gained the most humongous girth. Starting in June, 12 bears were photographed regularly, and by late fall two of the most corpulent — each weighing something over 1,000 pounds — were left vying for the “year’s most fabulous flab.” Now, the winner in this year’s great fatness face-off has been announced: Bear 409, a “gigantic gal with a marvelous muffin top.” Though runner-up Bear 747 was a strong competitor (described as “blimpy,” with a belly that “barely has clearance to the ground”), Bear 409 won the public’s heart, pulling in 7,000 likes on social media, compared with her rival’s 3,000. Bear 409 also boasted formidable feminist credentials, being “a single mom trying to make it in the wild,” as one woman commented on Facebook. “She deserves it … has had four multiple-birth litters and raised her cubs to maturity. About time a female bear won!” Another fan swore: “I would die for Bear 409.” The park is home to some 2,200 brown bears — the most in the world, officials say — and given its many millions of migrating fish, said park ranger Andrew LaValle, “If you’re gonna be a bear, Katmai National Park is a good place to be one.” Another advantage: It has “Bear Cams,” so that, as writer Ruben Kimmelman of Northwest Public Broadcasting says, diehard bear aficionados can tune in to see the animals living off the fat of the land. Meanwhile, in northern Montana, a 900-pound male grizzly became a problem after he wandered into an open garage in a Hutterite community and refused to leave. “He fell asleep right in the corner,” reports the Billings Gazette. No amount of yelling, mace or honking could persuade him to decamp. Montana Fish, Wildlife and Parks was called in, and staffers decided to tranquilize the bear. That turned out to be the easy part; the hard part was moving it. Six people had to be enlisted to push a tarp underneath the snoring grizzly and then hoist him into a cage. When he awoke, the bear was released near East Glacier.